Robert Storr, “Suzy Fishing,” 2002-12. Flasche on board, 20 x 24″. Courtesy of the artist. Photo by Zack Garlitos. In “Suzy Fishing,” the formal structure of reductive abstraction and the pace of Storr’s temperament are harmoniously infused in one unified surface: the solid substance of the paint. 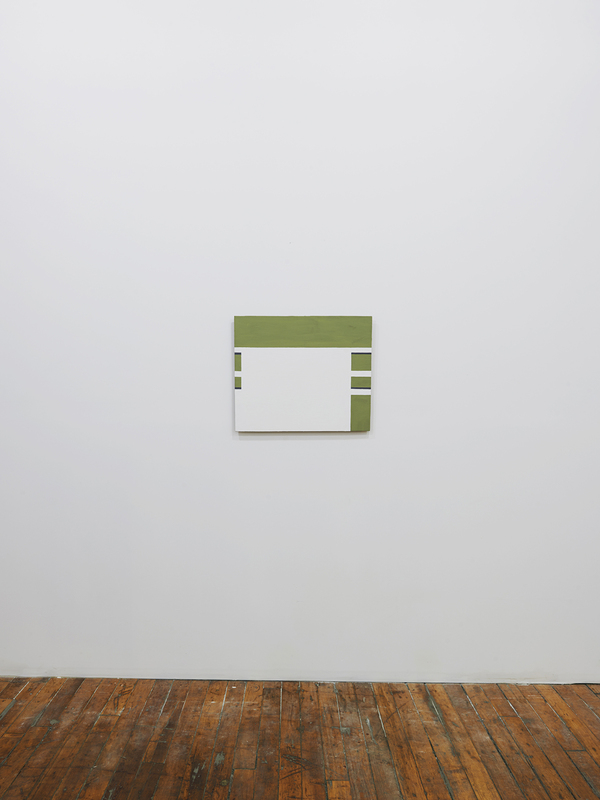 The entire space is divided into four unequal bands of olive green: the first one hovers on the top uninterrupted; the next two, right below, share the common feature of a solid black outline that barely anchors them to either side of the canvas—they’re on the brink of collapse due to the dominance of the white field that appears to push everything off the edges of the painting. The bottom right band stands tall, though it has lost its companion on the left. The result is a disparity between what is considered stable and unstable. This subtle discrepancy of a rectilinear structure is similarly evident in Storr’s manner of building the surface. In addition to selecting Flashe paint (a vinyl-based pigment that dries evenly with sizable, fairly uniform, velvety matte or opaque coverage), all the straight lines are made by hand—slowly—showing the imperfection on either side of each line or edge. In this territory the appearance and function of line and edge are forever ambiguous. I should add that the use of canvas board offers a strong support, which makes it possible to paint so slowly. Perhaps, as the title “Suzy Fishing” suggests, both the image of the water under the bridge and Suzy sitting above are one integrated metaphor of the patience required for self-contemplation and the potential within time, for time is of the essence.